In this part we'll focus on the protocol and timing for communicating with the LED board. 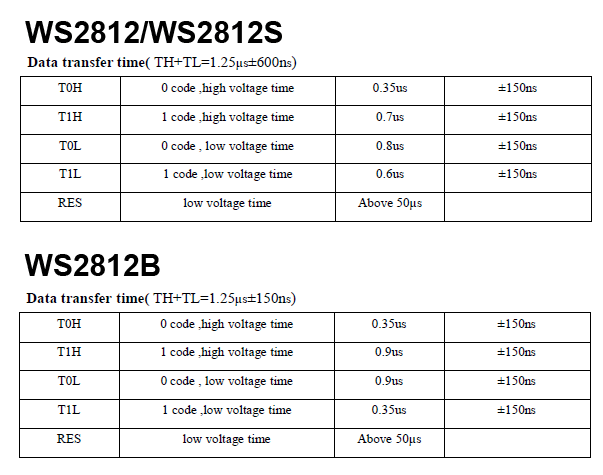 This article explains the protocol and timing to talk to the WS2812B (or Adafruit NeoPixel) LEDs. It explains an approach with timers and DMA to meet the hardware requirements. I’m using GNU ARM Embedded (launchpad) tools with an Eclipse based IDE (Freescale Kinetis Design Studio v3.0.0). As software drivers I’m using the Freescale Kinetis SDK v1.2. 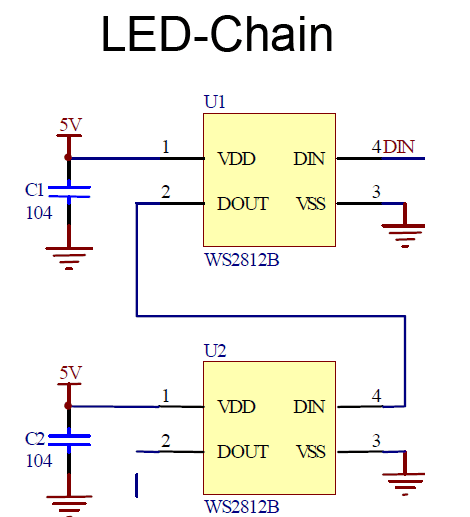 The WS2812(B) LEDs have a built-in current driver with a shift register: writing data to the shift register will latch the bits, and the constant current driver will ‘drive’ the current to the Red, Green and Blue part of the LED. Data is written on a single wire (DIN pin) the first WS2812 in the chain. The first device will ‘keep’ the first 24bits, and everything else is shifted out to the DOUT pin. 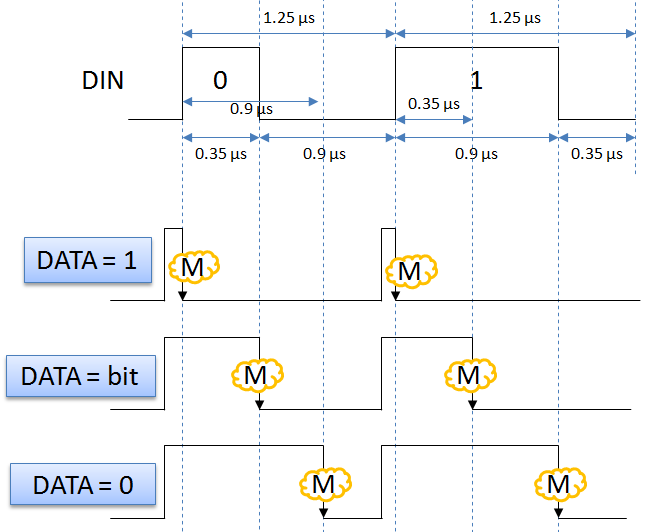 So to provide data to 2 LED’s, I shift 2x24bits: the first 24bits are for the first device in the chain, then next 24bits for the next in chain, and so on. 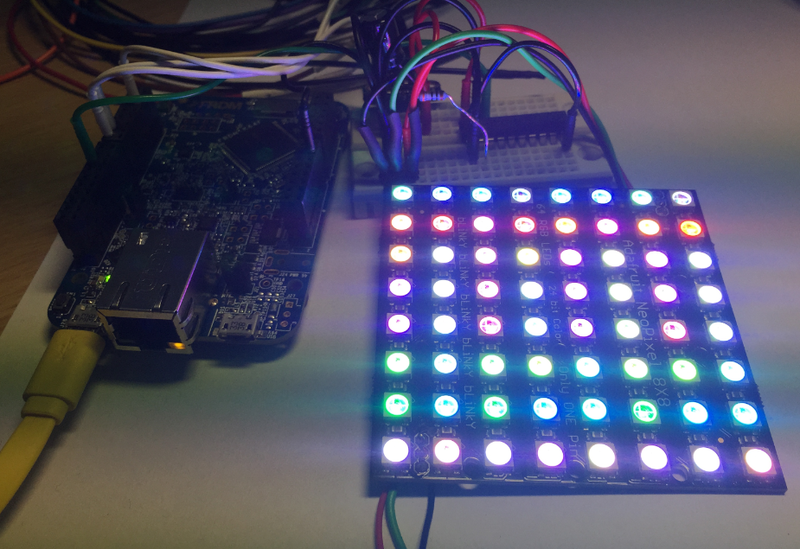 Each LED needs 24 bits, encoding the colors Green, Red and Blue with 8 bits each. So it is GRB, not RGB! Each color 8bit determines the brightness of that color, from 0x00 (off) to 0xff (full brightness). the bits are sent MSB (Most Significant Bit) first. But the signal frequency is 800 kHz! 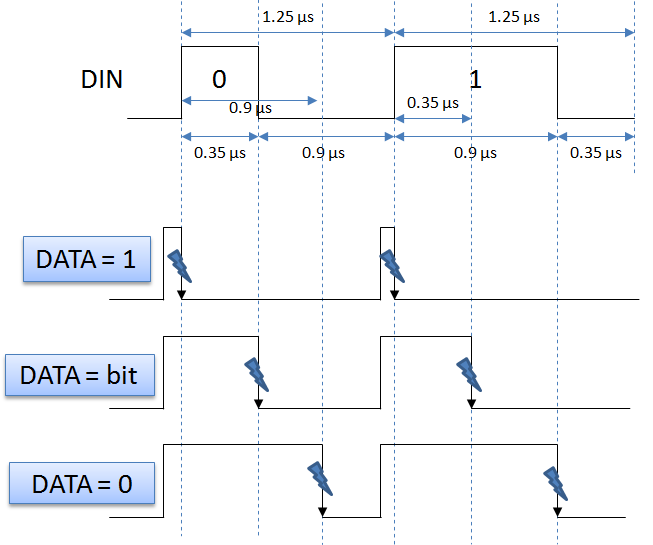 So Bit-Banging won’t work, unless you are using hand crafted assembly coding to reach the speed and timing. Additionally I would have to disable the interrupts, as any interrupt can screw up the timing too! Turning interrupts off for a few LEDs will work, but the longer the LED chain, the longer the interrupts have to be turned off. Definitely not good enough. This is now much better than doing things in a loop. Still it means interrupts happening with 3×800 kHz, or every ~0.35 µs an interrupt! Yikes! My system will be busy with interrupts pretty much all the time: For every interrupt, the CPU needs to stack the registers, change the contect to the interrupt service routine, performe the operations to the DATA register in the routine and return back to the original context. A lot of operations! So if toggling a pin is too slow, using interrupts creates too many interrupts, why not finding a way to have it faster? The solution to this is DMA (Direct Memory Access). DMA allows todo operations without using the CPU. DMA allows me to read/write memory (and more), and is like a kind of co-processor. That way the operation can happen in the background, without CPU involvement :-). And good new is: many modern microcontroller have DMA capabilities, and the Kinetis K64F on the FRDM-K64F board does have it too :-). 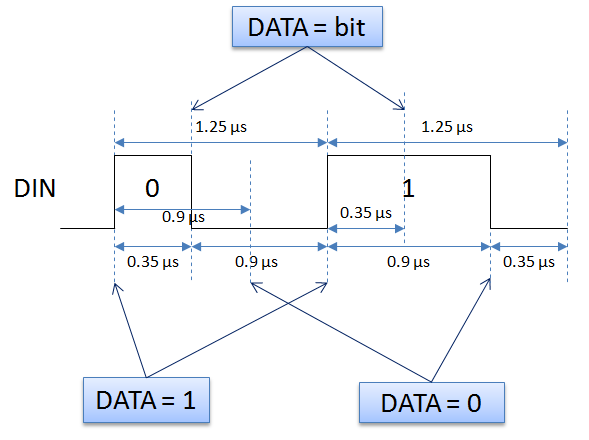 In this post I explained the concepts behind generating the correct bit stream to drive the WS2812B NeoPixels. As the signal is a high frequency one, I have to utuilize timers with DMA, otherwise the CPU will be loaded too much.